10 Songs I love right now….. 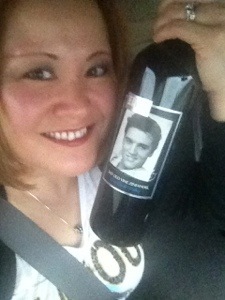 I saw this Blog Challenge yesterday and toyed with doing it. It looks like a big commitment and some of the items are things that seem a little TMI for me to share. But the purpose of blogging for me, is to challenge myself to step outside of my comfort zone and to write more often and sharpen my skills. I figured this was a good way to do it so I am going to jump in. To avoid being redundant, I’m starting with Day 2. I’m going to count my original post and picture for my blog as Day 1. 1. I love to read (I know, obvious!). 2. I’ve only had two adult jobs in my life. The most recent one for almost 14 years. 3. My favorite author is John Steinbeck. I love his writing style and how he tells such a colorful story. 4. I’m a dog person. 6. Music is therapy for me, but I don’t often know artist’s names, even for songs that would seem obvious. 7. I didn’t know how to love deeply until I had my sons. 8. I love to sing loudly in my car like nobody is watching. 9. I don’t have a favorite color, but I don’t like the color peach. 10. I don’t have a favorite food. I like mostly everything. 11. I write to cleanse. 12. I think different accents are beautiful and I love listening to them. 13. I’ve only ever had three cars in my life. 14. I wish I was three inches taller. 15. I used to write poetry but haven’t written a poem in a long time. 16. I love country music because of the stories the songs tell. 17. I wish I was funnier. 18. This is a more difficult exercise that I thought it would be. 19. I’m working on my second book, but haven’t had as much time to work on it as I would like. 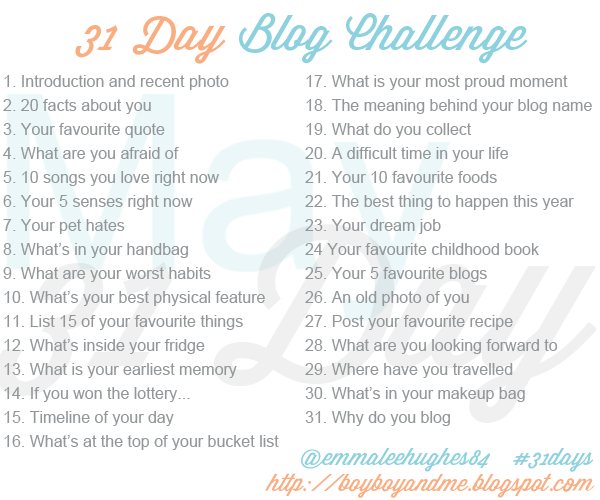 I love this idea about the 31 Day blogging challenge. I think I”m going to do it. I don’t know that I can do 31 days in a row, but I love the challenge so I will do my best. I believe that I already did step one in my original post and the picture is fairly recent, but I will post a more recent one just for fun. I think I am going to skip to day 2 🙂 Thank you Samantha for sharing this!! Today is Day 14 of the 31-Day Blogging Challenge, which means I’ve hit the 2-week mark! I’m pretty excited about this, because I’m about halfway finished with the whole challenge! So, today’s challenge is…”If You Won The Lottery”. This is actually an interesting question, because my family and I discuss what we would do if we won! 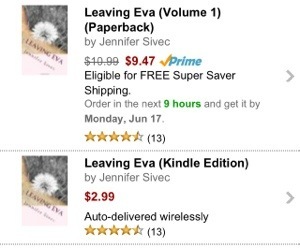 I woke up and looked at my Amazon page to find another review! It’s like riding a roller coaster in 1.2 seconds anytime I see that I have a new review. I’m excited, I’m terrified, I’m excited, I’m terrified, then I’m exhilarated. The reviews don’t have to be perfect, they don’t have to say only good things. I’m just thrilled to get one. Now-I say this, but I’ve only had 13 so far and none of them have ripped me…yet. 😄 So when that happens, I’ll post again and we will see if I’m quite as chipper about it. I know that my writing style is a little different, so I’m really happy that people seem to appreciate that. I like to tell a big story because its just how I see life. Everybody’s life hinges on the lives and choices of those around them, so that’s what I try to convey. I love stories that are multilayered, and I’m so happy that its been recognized and appreciated in my own writing.